A beautiful vintage, dry and fresh, expressing all the typicity of a grand Cheval Blanc. Complex, balanced, dense and fresh, he is made for a long ageing potential. The first few months of the year were mild and very wet (420mm of rain between January and March). 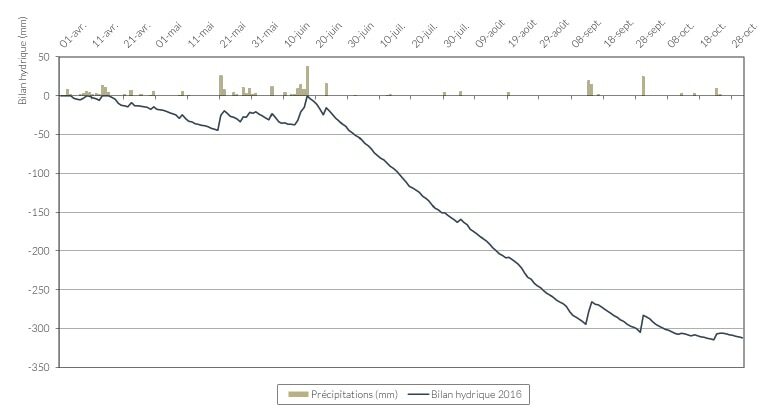 Normal temperatures prevailed between April and June with a lot of rain (273 mm). 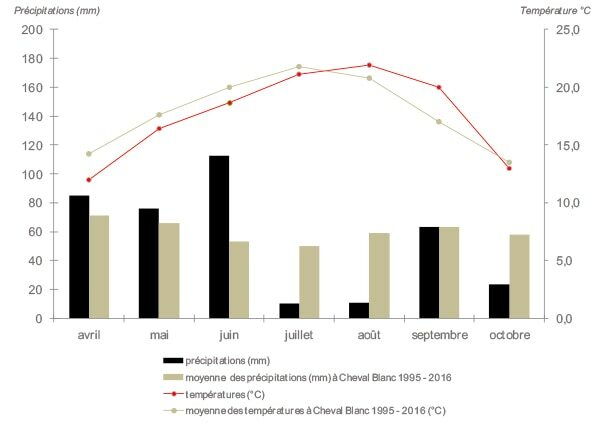 By the end of June, dry and sunny conditions set in, interrupted only by a few rainy spells in September (13-14 and 30 September). Extremely dry conditions prevailed between 1 July and 15 October. The most hours of sunshine for 15 years were recorded over July, August and September. In July, temperatures were about average. August and September were hot with relatively cool nights. The harvest took place between 20 September and 12 October in mostly dry conditions. In 2016, there was a big difference in the water regime between the beginning and the end of the season. The first six months of the year were extremely wet (695 mm, which is a great deal more than during the entirety of 2015). At the end of June, therefore, the soils had nearly reached their limit in terms of water-holding capacity. However, the weather was exceptionally dry from the beginning of July up to the end of the harvest. The vines reacted differently to this unusual water regime depending upon the soil types. On clay and sandy soils (where the roots could reach the water underground) there were sufficient water reserves. 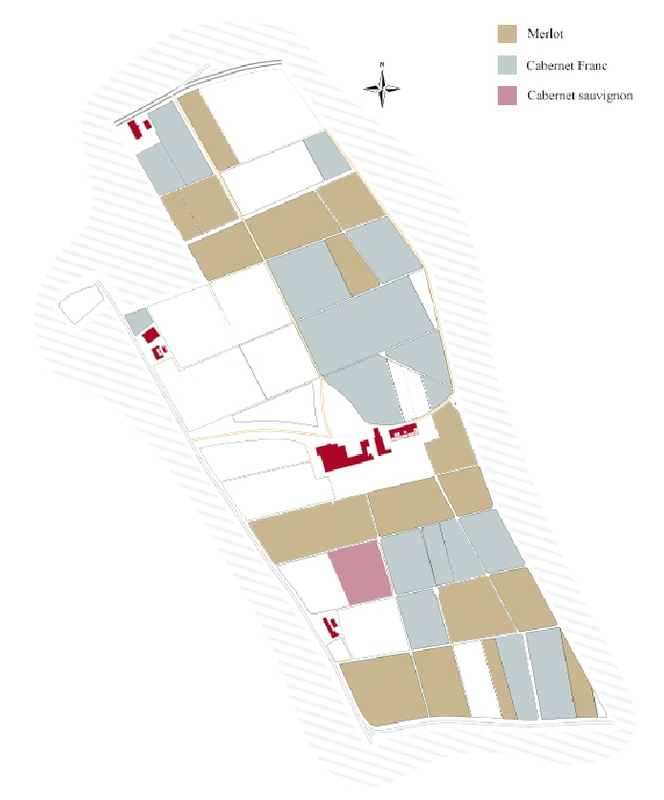 On these soils, the limited water regime had a positive impact on the quality of the grapes. The dry conditions had a negative impact on young vines on gravelly soils, as they caused leaf loss and impeded the process of maturation. Old vines on gravel soils with deeper roots, however, fared well despite the lack of water and this had a positive impact on the quality. In 2016, the bud burst was early but, following relatively cool and extremely wet conditions in April and May, the vines flowered only a week or so later than usual. There were no particular problems during fruit set despite variable weather conditions during flowering. The vines ripened late and in batches. The dry conditions altered the maturation process depending upon the soil types: The process was accelerated on clay and sandy soils whereas maturation was delayed in young vines planted on gravelly soils. So, these plots which are usually amongst the first to be harvested were the last to be picked. The harvest took place over 23 days between 20 September and 12 October with lovely weather interrupted only by a couple of rainy spells. One plot of Cabernet-Sauvignon, planted in 2014, yielded its first harvest in a perfectly mature state. The beginning of the season was blighted by mildew. But, thanks to good weather from the end of June, this had no negative impact. The harvest was an exceptionally healthy one. Le début de saison a été marqué par une forte pression de mildiou. Grâce au beau temps qui s’est installé à partir de fin juin, cette pression n’a pas eu d’incidence négative. L’état sanitaire à la récolte fut exceptionnel. The conditions were good for the development of the vine and the fruit set. Despite the dry conditions in the second part of the season, the berries were of about average weight and the yields were well above normal for both grape varieties. The hydric stress came late in the season and so didn’t impact upon the weight of the berries. Another reason for this is that there was plenty of nitrogen in the soil. In 2016, the level of sugar in the grapes upon vatting was about average for the previous ten-year period. 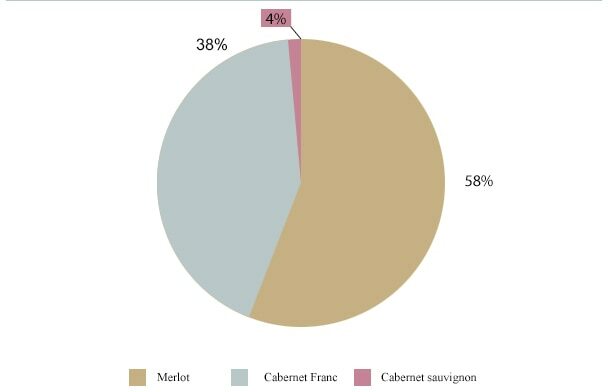 The total acidity was lower due to slightly high levels of malic acid in the grapes. This is fairly typical in years of water stress and means that the grapes were properly matured when harvested. What was exceptional in 2016 was the fact that the low levels of malic acid were not offset by high levels of pH. An initially discreet nose the reveals complex aromas very quickly. A palette of red and black fruits, such as cherry, raspberry, blackberry and blackcurrant dominate. In addition, there are abundant floral notes of violet, rose, lily and peony. As the wine gradually opens it reveals almost caramelised notes with pepper and spices. A vibrant and clean nose. The attack is creamy and mouth filling, developing into the mid-palate with powerful, round tannins which are both rich and elegant, voluminous and refined. The balance between the tannins and acidity lend freshness and fruitiness and an extremely long finish. The aromatic intensity of this Cheval Blanc is impressive.